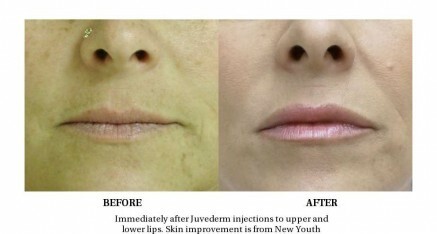 Immediately after Juvederm injections to upper and lower lips. Skin improvement is from New Youth Cosmeceuticals. 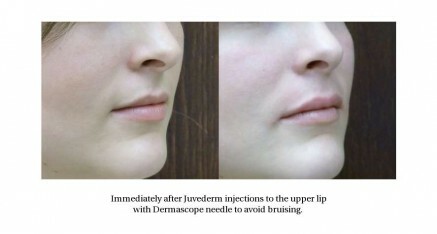 Immediately after Juvederm injections to the upper lip with Dermascope needle to avoid bruising. 24 hours after injection with Juvederm UP to upper and lower lips. Pre-treatment age is 50 and the post-treatment is 54. She was a good candidate for a face life, but didn’t want one, so we elected to use Sculptra for re-volumization to change the shape of her face back to a much more youthful shape. 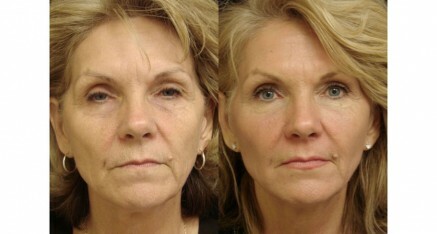 Remember, faces devolumize with age. The other issue is loss of elasticity. This was addressed with the Fraxel Re:store tighten the skin. She is also on the New Youth Skin program and has a small amount of Perlane in her lips. This patient’s primary problem is acne with acne scarring. This can be a very difficult problem. 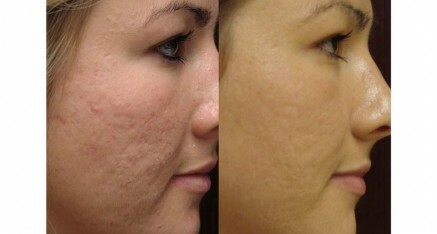 She was first put on our New Youth Acne program followed by several Fraxel Re:store treatments. Her pre-treatment age is 53 and post-treatment she is 54 years old. She underwent Sculptra treatments to re-volumize and a single Fraxel Re;pair, a CO2 Fraxel laser, to tighten and resurface the skin. As in all patients, she started with the New Youth Skin Treatment System of products to use at home. This patient is 57 years old and has spent many years in the sun. 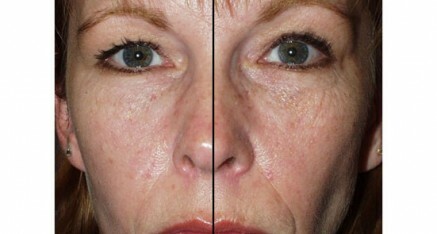 She started on the New Youth Skin Treatment, followed by Sculptra injections and finally the Fraxel CO2 Re;pair laser. She is elated with the results. 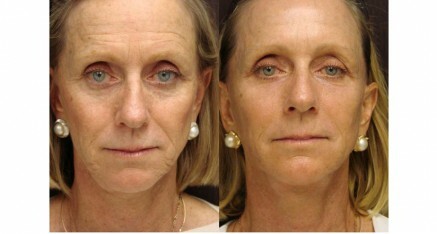 Patient is 59 years old and has never had cosmetic surgery. 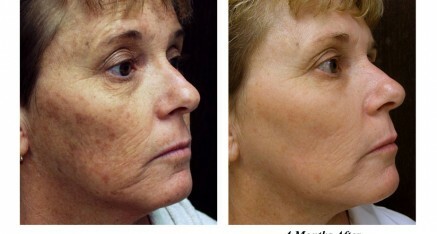 She has been on New Youth Skin Treatment for 10 years, and her skin texture and clarity shows it. 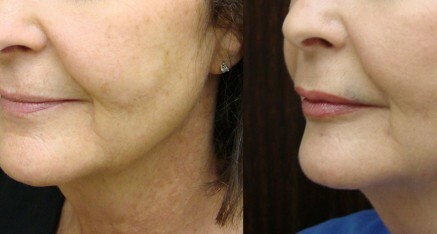 She had two sessions of Sculptra injections. 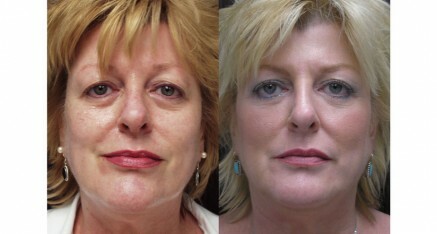 Note the rounder cheeks, which are a sign of youth and the filled in areas under the eyes. 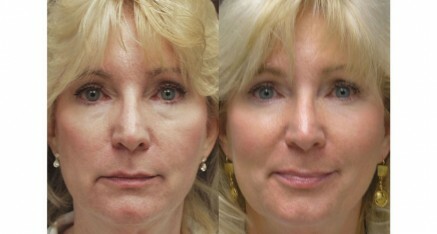 She is 48 years old and used New youth and had two sessions of Sculptra injections. Note the areas under her eyes and fuller cheeks, particularly under the eyes. 51 year old following New Youth Skin Treatment creams and serums, one Fraxel CO2 laser (the Restore) treatment, and two Sculptra injection treatments to fill de-volumized face. She has had no surgery. 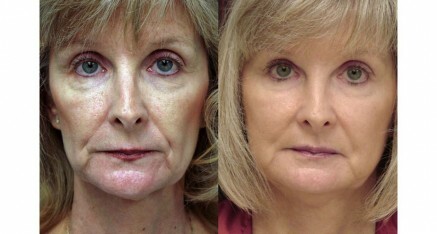 This patient only used the New Youth Skin Treatment Skin Care line on the right side of her face for one month. 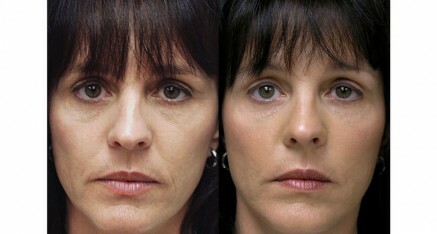 Note under the eyes, Crow’s feet upper lip, and clarity of the skin.